Camden Market was originally a crafts market but now offers a wider range of goods including clothing, bric-a-brac and fast food. 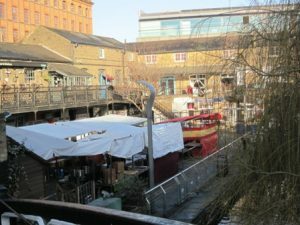 The original market was founded in 1974 and was located next to Camden Lock but over the years it has spread considerably until it is now a complex of markets. Market day is predominately Sunday, but many stalls open on Saturday and traders operating out of fixed premises open all week.